Catherine McGrath became one of the first ever acts to play Black Deer in Kent, which is set to be a hugely successful festival. Playing on the Ridge stage, Catherine drew a fair sized crowd but as previously mentioned, would have been nothing to do with her other than that she was playing as people were still arriving. Catherine has been super busy since she was signed with Warner bros. Performing non stop shows, ranging from support slots to major US artists such as Dan + Shay, Kelsea Ballerini to sold out headline shows and festival performances, Catherine has built quite the fanbase. 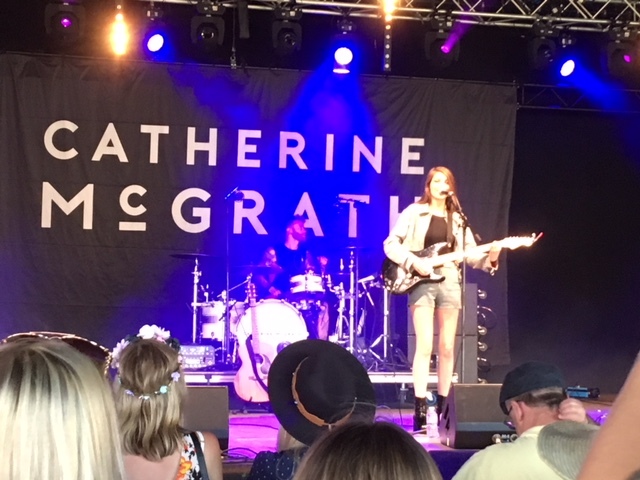 With her debut album coming out next month, Catherine gave a very excitable performance filled with fan favourites such as Hell Would Have To Freeze Over, Wild, Just In Case, Thought It Was Gonna Be Me, Talk of this Town and new song Good at Love. Catherine is always very sweet on stage and interacts well with the crowd. Sharing her stories behind the songs, Catherine comes across as very nice, genuine young woman who could easily be your friend. With influences from Taylor Swift, Catherine has a fresh sound that draws not only a large young crowd but appeals to the older audience too with her music having a great blend of young lyrics to relate to her younger fans and a more mature sound that appeals to all ages. With a full band backing her, Catherine has grown from strength to strength and the world is her oyster. We cannot wait for her album Talk of this Town on July 27th which can be pre ordered now.